6502bench is a code development "workbench" for the 65xx family of processors, including the 6502, 65C02, and 65802/65816. 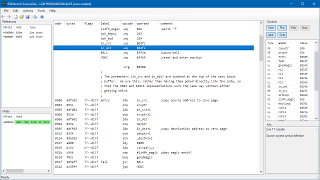 It currently features one tool, the SourceGen disassembler. Fully interactive point-and-click GUI. Define labels, set addresses, add comments, and see the results immediately. Add multi-line comments and have them word-wrapped automatically. The disassembly engine traces code execution, automatically finding all instructions reachable from a given starting point. Changes to the processor status flags are tracked, allowing identification of branches that are always/never taken, accurate cycle count listings, and correct analysis of 65816 code with variable-width registers. Easy generation of assembly source code in popular formats (currently cc65, 64tass, and Merlin 32). Cross-assemblers can be invoked from the GUI to verify correctness. Symbols and constants are provided for ROM and operating system entry points on several popular systems. Project files are designed for sharing and collaboration. Support for 6502, 65C02, and 65816, including undocumented opcodes. Hinting mechanism allows manual identification of code, data, and inline data. Editable labels are generated for every branch destination and data target. Automatic detection and classification of ASCII strings and runs of identical bytes. 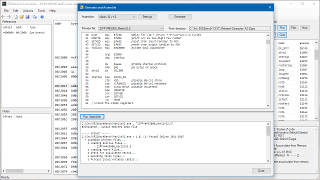 Symbol files for ROM entry points, operating system constants, and other platform-specific data are stored in plain text files. Extension scripts can be defined that automatically reformat code and identify inline data that follows a JSR/JSL. "Infinite" undo/redo of all operations. Cross-reference tables are generated for every branch and data target address, as well as for external platform symbols. Instruction operand formats (hex, decimal, binary, ASCII, symbol) can be set for individual instructions. References to nearby symbols are offset, allowing simple expressions like "addr + 1". Data areas can be formatted in various formats, including individual bytes, 16-bit and 24-bit words, addresses, or strings. Multi-line comments can be "boxed" for an authentic retro feel. Notes can be added that aren't included in generated output. These also function as color-coded bookmarks. Very useful for marking up a work in progress. 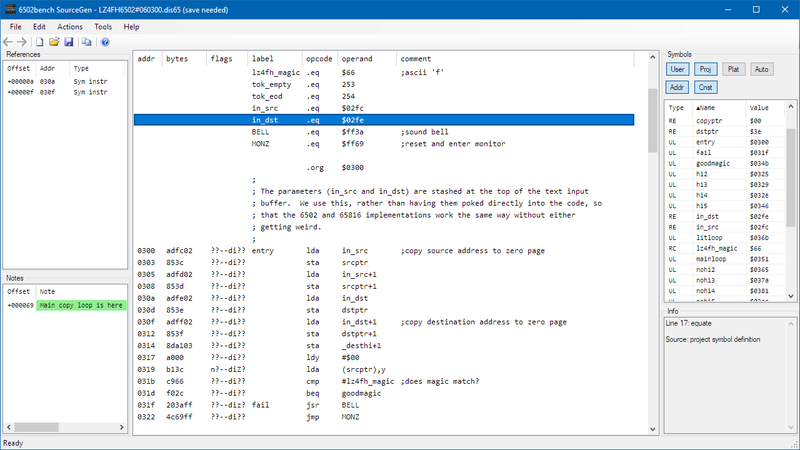 Instruction summaries, including CPU cycles and flags modified, are shown along with a description of the opcode's function. Various aspects of the code display can be reconfigured, including upper/lower case, pseudo-opcode naming, and expression formats. These choices are not part of the project definition, so everyone can view a project according to their own personal preferences. Labels can be coaxed from global to local as allowed by the assembler. Symbols may be exported from one project and imported into another to facilitate multi-binary disassembly. All data files are stored in text formats (primarily JSON). The project file includes nothing from the data file but a CRC. This may allow the project to be shared without violating copyrights (subject to local laws). SourceGen is written in C# .NET, with the WinForms API for the user interface. The full source code for the project is available on GitHub, licensed under Apache 2.0.